NASHVILLE, Tenn. — It's not often a man can say he's the best in the world at what he does - unless he's Mark Prudhomme, from Georgetown, S.C.
After displaying nerves of steel and amazing skill, Prudhomme was crowned champion in the Owl Hooting Division at the Grand National Turkey Calling Championships in Nashville, Tenn., Feb. 17. By winning a division at the world's most prestigious contest, Prudhomme is in fact, the best in the world. 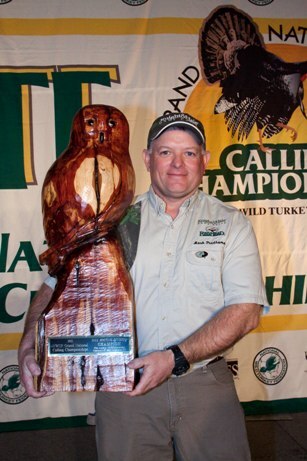 Mark Prudhomme was crowned champion in the Owl Hooting Division at the Grand National Turkey Calling Championships in Nashville, Tenn., Feb. 17. "It takes extra time to work on your calling for this competition," said Prudhomme. "Months and months of preparation comes down to one minute on stage. You have to make the most of that minute." "When we call the name of a new grand national champion, the atmosphere in the room in electric," said George C. Thornton, NWTF CEO. "It takes a special talent and years of practice to master the sounds of wild turkey or owl. To become a champion on our stage is the most prestigious honor a turkey caller can achieve." This year, champions will be crowned in 10 divisions at the 35th annual NWTF convention, which is sponsored by MidwayUSA and housed at the Opryland Resort and Convention Center. In the Owl Hooting division, callers imitate the hoots, screams and laughs of a barred owl. Overall, the winners from each division competed for their share of more than $25,000 in cash and prizes.